Finally we have done it. Yes, the umbilical cord to the ‘real’ world has been cut and right now we are anchored for the first time in 4 months.Cutting the cord is not all that easy. The air conditioning is the first and largest of all cords to cut. We found someone who is going to make good use of it while we are away. Holger and Antje onboard S/V Freja are going to enjoy the comforts of a good nights sleep. We will probably have to sneak over in the middle of the night and take it back from them when we return! But it’s not only the air conditioning that has to be disconnected. We also have a small bar fridge, two large table top fans, recharging cords for all the electric gadgetry that we get used to while being plugged in at the dock. Now we are down to the basics and can recharge only those items for which we have enough solar power to make work. One advantage is that we do not have to negotiate a maze of wires when we come down below. Everything is put away in its sailing place and the boat actually now looks like it should i.e. everything in its place, nothing about to fly off the shelves or roll off the berths, ice in the cooler and a bottle of rum on the table! Just an aside for anyone reading this while intending to sail in this area. Langkawi is duty-free and, although Muslim, sells alcohol by the ship load at far reduced prices than for what is for sale in Thailand. So like every good Samaritan we load up to keep us going while in Thailand. The other umbilical cord to cut is that to new-found friends. We finally have met a few people not only locally but also cruisers. It’s amazing how long many of these people have been out sailing. Some for as long as 35 years without stopping, some new to the lifestyle and others who have been living onboard in Malaysia as a retirement lifestyle and making the occasional long or short passage during the right season. Every time one leaves an anchorage you never know when you will meet up with these people again. Some will be there when we return and others will have moved on to other countries, other oceans and only by chance will we share another anchorage again. Perhaps we should start a seniors home for wayward sailors where we can all sit around the pool and tell tall tales of storms and pirates, sinkings and drinking, passages and landings. So, what are we doing? We are headed north to Thailand in the SW monsoon season. 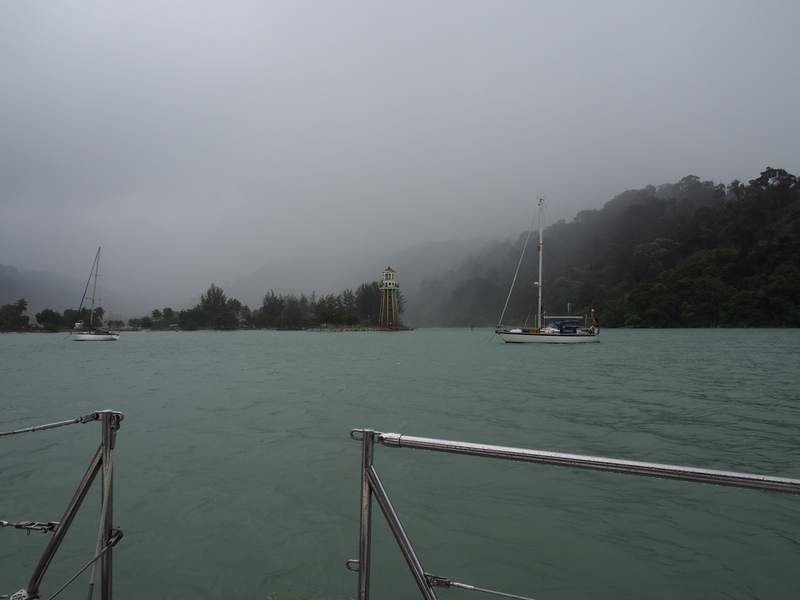 Right now we are holding tight in Telaga Harbour as there is wind, too much wind. It is the longest I have seen the wind blow from the same direction and in some strength since we left Singapore. The rain pelts down, the swell sneaks around the headland we are taking shelter behind and the boat sways from side to side as the gusts come and go and the boat turns sideways to the swell. We have left Langkawi until October when we will return to greet the return of Dave and Marcia, sailing friends from the 1980s, who have come back to reclaim their boat from dry land storage. I read of your sitting out a blow and rolling at anchor with great nostalgia tonight. I did not always enjoy sitting out a blow at anchor…but I sure do remember it fondly. Also, I do wish we could bottle some of our summer (fog and 65* days) for you and have you send some of yours our way. I could do with a little more heat and humidity…not to mention rain! We may be convinced to trade you a few weeks but I know how that fog seeps into the bones and makes them ache. Here is to sending you some heat and humidity.